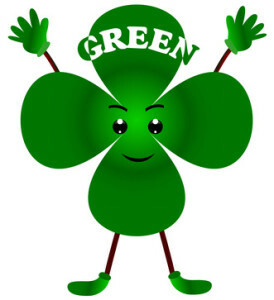 We recently published an article about eco-friendly ideas for your kitchen, and with St. Patrick’s Day being tomorrow, it seemed fitting to continue on the whole “go green” idea. In the earlier article, we touched upon some bigger ticket kitchen items that may require a little more “green” up front, but will certainly make an impact on your utility bills; the appliances, windows and cabinets. Currently I am in the process of updating my own kitchen, and looking at my chipped floor tiles inspired me look into “green” alternatives to the popular flooring we all know and love. Let’s take hardwood floors for example. For about the same cost, or even a bit less, give bamboo floors a try. If you choose a woven or solid bamboo, it is very comparable to hardwood. Bamboo is one of the Earth’s most rapidly renewable resources, taking only about 5-7 years to mature; while it’s hardwood counterpart can take anywhere from 50-120 years. Manufacturers now even offer a formaldehyde-free chemical adhesive. If you still have your heart set on the hardwood look but have a tight budget, another option would be laminate hardwoods. Manufacturers of laminate flooring use a large amount of recycled waste wood, typically around 70% or more; such as wood chips and shavings from log processing, and saw dust from saw mills. They also use a formaldehyde-free or low-formaldehyde binder. Laminate flooring creates the look of a natural resource, and can resemble stone and tile as well. Cork is another popular option for floors. It is harvested by peeling bark from the tree, so the tree does not actually have to be cut down. This process can be done about every 7-9 years without harming the tree, which makes it another one of the most sustainable natural resources. Cork can be cut into tiles or planks; it is resistant to moisture damage and is naturally hypo-allergenic. Cork also provides elements of acoustical and thermal insulation, and gives a nice cushion for your feet. If you were thinking about vinyl, a great alternative would be linoleum. Linoleum is made from all natural materials, which make it biodegradable. In addition, it is easy to maintain and extremely durable, resisting dents up to twice as much as vinyl, giving it cost-effective longevity. You can find linoleum in a wide array of colors, designs and patterns. There are so many eco-friendly options out there – we have barely even scratched the surface, but hopefully got your gears turning. Whether you are going for an extreme makeover, or just adding a pop of color, it can be done “in green.” And hey, you can even do it on a budget.